GET FIGHTING FI. . .
you know that three out of five people using office chairs suffer from back and neck pains? And did you know that physiotherapy can provide relief in 80 per cent of the cases? MYTH VERSUS FACTSMyth: Rest will cure me. Fact: Too much of it might actually rust your joints. • Myth: It helped him, so let me try it also. Fact: Your body is different from anybody else’s. • Myth: I’m old. This had to happen. Fact: Advancing years may be inevitable, but there’s no excuse for senility. • Myth: I exercise in the gym, so why physiotherapy? Fact: The gym is for fitness management, while physiotherapy makes you fit for working out in the gym. Ultimately, physiotherapy helps in enhancing the quality of life through a scientific approach that prevents and cures physical ailments through biomechanical methods. Recently, the Prime Minister of India, Atal Behari Vajpayee underwent knee replacement surgery at Breach Candy Hospital, Mumbai, India. His complete recovery would have been impossible but for extensive post-surgery physiotherapy. This therapeutic science arose when humans first felt pain and evolved methods to ease it by moving, warming or massaging the painful area. Physiotherapy is the result of years’ research on the human body, analyzing the forces acting on it and their impact. All of which resulted in the evolution of manual, mechanical means and electrotherapy to effect corrective measures. Nowadays, physiotherapy is an essential discipline of medical science and broadly comprises exercise and electrotherapy. Using the knowledge of biomechanics and the skills of exercise therapy, the therapist formulates the exercise regimen. These are done actively by the patient, passively through the therapist or under expert supervision. • Relief from pain and muscle spasm: interferential therapy (IFT), ultrasonic therapy and laser. • Other useful techniques include traction and ice therapy. According to norms laid down by the Indian Association of Physiotherapists (IAP), a physiotherapist is one who is licensed to practice the profession. He or she is a graduate with a bachelor’s degree or an advanced postgraduate degree following extensive educational and clinical training. Currently, IAP has around 6,400 registered members. Institutes teaching physiotherapy—both government and private—are growing. My experience with physiotherapy dates back to my childhood. My mother, Dr Satwinder Kalra, is a physiotherapist and currently heads the Physiotherapy and Rehabilitation Department at Dayanand Medical College and Hospital in Ludhiana, India. Often, after school and during summer breaks, I would visit her office. What drew me to this profession was the sheer exhilaration of an old man who, thanks to physiotherapy, started walking after having been crippled for almost 10 years. Physiotherapy is both a curative and preventive discipline. A physiotherapist is healer, architect and psychoanalyst rolled into one. He or she advises people on the correct posture to sit, sleep and work. For people with special needs—like a wheelchair-bound person—he helps design the house/workplace so that the patient becomes independent in day-to-day chores. As a psychoanalyst the physiotherapist ensures that the patient’s initial despair is replaced by realistic hope. In the West, physiotherapy is an integral part of health care. In India too, with the services available in hospitals, nursing homes and specialized pain and rehabilitation clinics, people are increasingly adopting this drugless therapy for pain management. The cases alleviated range from postural problems to paralysis, cerebral palsy in children, muscle and joints pain, nerve injuries, post-accident trauma, post-burn complications, pre and postnatal conditions and breathing problems, among others. Owing to age-related joint pains and dysfunctions, old people often require a physiotherapist’s advice to prevent injuries and chest complications and to ease movement and increase functional capacity. In sports, good physical and mental health is paramount. Pulled hamstrings, shoulder, wrist, back, knee or ankle injuries and sprains are some of the problems that regularly require a physiotherapist’s attention. Besides relieving pain, a physiotherapist devises strategies to avoid injuries and maintain the joints, soft tissues and overall posture in a good state. 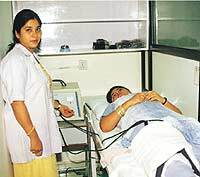 Having worked in the ICU, general wards, burns division and OPDs at Indian medical institutions like Safdarjung Hospital, Dayanand Medical College and Hospital and the Indian Spinal Injuries Centre, among others, I realize that the real success of any treatment lies in the cooperation between the therapist, the patient and his family. Saroj Gulati had been suffering from rheumatoid arthritis since 1969. After she took a turn for the worse five years ago, she began doing the rounds of hakims, masseurs and doctors. In vain. The pain only increased. Last September, she tried physiotherapy. Besides relieving the pain, the treatment aimed at improving and maintaining her muscle strength. After six months of vigorous exercise and electrical muscle stimulation, along with lifestyle changes, Saroj can now walk. Four year-old Ankur had weak legs, slurred speech and lack of coordination due to cerebral palsy. Under physiotherapy for over a year, he now stands and walks with support. Abhishek Goel suffered knee injury in an accident and was operated upon. Physiotherapy began early and included muscle strengthening exercises to restore joint movement and electric stimulation. Within a month, he was back in action. Such cases are routinely treated by physiotherapists. More than 90 per cent of joint pains and dysfunctions are cured successfully through a supervised rehabilitation program, which includes hands-on treatment techniques, exercises and preventive education.